We certainly hope you’re not one of those folks who consider falling asleep faster as the lone factor in choosing a sleep supplement. Many overlook two other important ones: improved sleep quality and waking up refreshed. So many sleep products fall way short on these two considerations. We hope Peak Life Somnapure doesn’t. In fact, the manufacturer says it covers all three bases. Will it hit a home run? We’re eager to find out in this review. Good ingredient combo. Contains many time-tested sleep product ingredients. Extra health benefits. Helps reduce anxiety, lower blood pressure levels, improve heart health, etc. Questionable reputation. Some customers say it doesn’t work for them. Other Ingredients: Microcrystalline Cellulose, Dicalcium Phosphate, Croscarmellose Sodium, Stearic Acid, Vegetable Magnesium Stearate, Silica, Maltodextrin, Carnauba Wax, Hypromellose. Directions: Take two (2) tablets once daily, 30-60 minutes before bed. You work hard and then bust your tail at the gym for an hour or so. You’ve done most of the intangibles to stay fit and healthy – exercise regularly, follow a sound nutrition plan, and take supplements (such as protein powders). Just about the only thing that you need to do is get enough sleep. That’s a tall order for some people. More often than not, it’s the inability to turn their minds off which leads to stress and inevitably, endless tossing and turning in the sheets. You’ve tried reading a book and sipping on some tea to calm your wired mind, to no avail. Maybe you should try a decent sleep formula such as BPI SPORTS NITE BURN. Can Peak Life Somnapure cover all the sleep bases? The manufacturer accurately points out the dilemma of many sleep-deprived folks today. “Many of us struggle to get the proper amount of exercise, nutrition, and sleep that we need to live life at or our peak,” per Peak Life’s official website. “Between busy schedules, deadlines, and long hours, our health often comes last. That’s why we have developed a scientifically-formulated natural sleep aid just for you,” per the same source. We’re sure that got a lot of people’s attention. If you can relate to that, read on. Let us guess – they only focus on the falling asleep part. However, there’s more to a good sleep product than just helping you sleep faster. 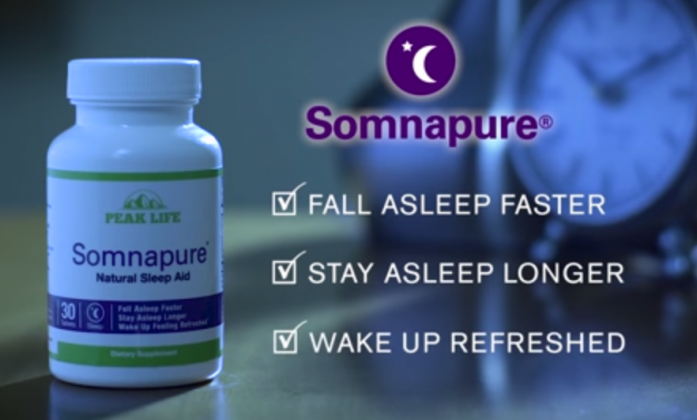 “Somnapure helps you fall asleep quickly, maintain high-quality sleep, and allows you to wake up feeling refreshed,” per the folks at Peak Life. There. They nailed the three aspects a competent sleep product has to have. However, can they deliver the goods? When we first laid eyes on Peak Life Somnapure’s ingredients list, we were impressed with its simplicity – it has only seven key ingredients. For us, that’s a sigh of relief. Far too many competitors rattle off a ton of ingredients. After sizing them up, we deem their products flawed and sub-standard. Just a complete waste of effort. Case in point: Animal PM. The ingredients will literally make you drown. 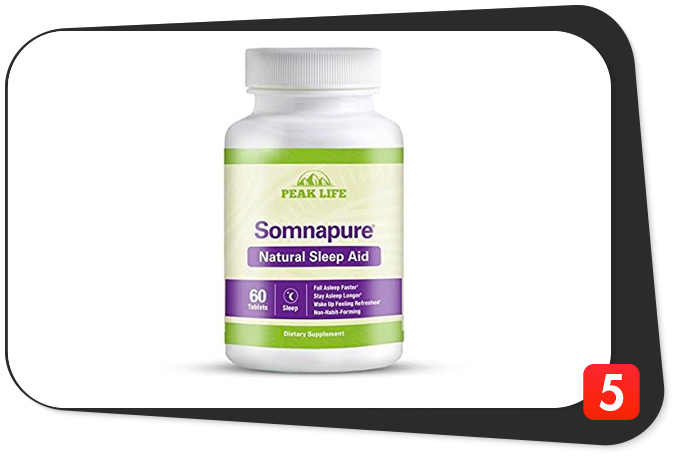 The main ingredient of Peak Life Somnapure is a sleep aid ingredient staple – 500 milligrams of valerian root extract per serving. Insomniacs have been using this herbal ingredient as early as the second century A.D. and with good reason: it works. We told you stress and anxiety could be the reasons why you can’t shut your mind off when you’re in bed. Valerian root extract’s ability to make you relax and quell anxiety make it a top-notch sleep aid ingredient, folks. Don’t be surprised if you’re out like a light before you know it. Helps regulate blood pressure levels – by keeping blood pressure levels in check, valerian root also helps boost heart health. Helps keep menstrual cramps at bay – good news for the ladies. Improves stress management – because valerian root helps quell anxiety, your lifestyle will improve as a result of reduced stress levels. Valerian root extract has exceeded insomniacs’ expectations time and again. We don’t expect that to change any time soon. We’re just glad it’s in Peak Life Somnapure. Next up are 300 milligrams of lemon balm extract (leaf) per serving. This ingredient also has a proven track record. In fact, people have been using it since the the Dark Ages. Just like valerian root extract, lemon balm extract helps reduce anxiety levels for improved sleep quality. Health experts credit lemon balm extract’s effectiveness to an oily substance known as eugenol, which helps stop bacterial activity dead in its tracks. Do you also know lemon balm extract acts as a potent antioxidant? That should scare the living daylights out of any nasty free radical. Peak Life Somnapure also has 200 milligrams of l-theanine per serving. This is a naturally-occurring amino acid found in green tea which helps offset the negative effects of caffeine without compromising its thermogenic and focus-boosting benefits. Here’s the harsh reality, folks: since many people lack sleep, they resort to a ton of caffeine just to get through their day. Before they know it, the caffeine overdose affects their sleep pattern at night. L-theanine helps keep that caffeine overdose in check. The good news: you also get to lose some fat because l-theanine doesn’t get in the way of caffeine’s thermogenic properties. Thus, this ingredient can help you sleep better and torch fat. We don’t think there’s a better combination than that. Plus, experts believe l-theanine helps improve the quality of sleep. Some studies suggest it didn’t make test subjects sleep longer. However, it helped them sleep better. As if that wasn’t enough, l-theanine also helps enhance mood. We’re sold. We believe l-theanine is a great inclusion in Peak Life Somnapure. Drinking more green tea (one of the world’s healthiest beverages) will also help ramp up your l-theanine levels more. This sleep product also has 120 milligrams of hops extract (strobile) per serving. This is an ingredient derived from the plant Humulus lupulus. An ingredient which acts as an effective sedative and has anti-carcinogenic and heart-boosting benefits? We’ll take it, thank you very much. We think it’s awesome Peak Life Somnapure has hops extract. Its next ingredient is 50 milligrams of chamomile flower extract per serving. This is another plant-based, sleep-inducing ingredient. It contains a flavonoid known as chrysin which helps put you to sleep. There you have it. Not only is chamomile an effective sedative, it’s also a great asset for long-term health. We’re stoked it’s in Peak Life Somnapure. This product also has 50 milligrams of passion flower extract per serving. When we reviewed ProSupps Crash, we said it’s an underrated sleep ingredient. In fact, we vouched for its inclusion in this bodybuilding product line. Passion flower extract acts in the same way valerian extract and lemon balm extract do: it helps you fall asleep faster by reducing anxiety levels. Just like chamomile, passion flower extract also has other health benefits. More specifically, the latter helps regulate blood pressure levels and keep inflammation at bay. Peak Life Somnapure’s final ingredient is three milligrams of melatonin per serving. This is another top-notch sleep ingredient. It’s a hormone which your pineal gland produces. Melatonin is best known for regulating your body’s sleep-wake cycle. However, some experts caution manufacturers not to combine melatonin with valerian extract in their sleep products because it may produce a very strong sedative effect. Okay, it just so happens Peak Life Somnapure has both. It’s now easy to see why the manufacturer included just three milligrams of melatonin per serving – it wanted to prevent the over-the-top sedative effect we mentioned. Valerian extract (root), 500 mg: A known sleep aid ingredient which helps induce relaxation and reduce anxiety levels. Experts believe valerian root extract also helps regulate blood pressure. Lemon balm extract (leaf), 300 mg: Another key ingredient which helps lower anxiety levels for better sleep quality. It contains a substance known as eugenol, which helps keep bacterial activity in check. Lemon balm extract also helps ward off free radicals. Impressive, to say the least. L-theanine, 200 mg: Found in green tea, this naturally-occurring amino acid helps offset the negative effects of caffeine to improve sleep quality. Plus, l-theanine helps enhance mood. Hops extract (strobile), 120 mg: A lesser-known plant-based ingredient which improves sleep quality, ward off free radicals, and boost cardiovascular health. Chamomile flower extract, 50 mg: A potent sedative consumed in tea form. It also helps regulate the immune system, keep free radicals at bay, and regulate blood sugar levels. Passion flower extract (aerial), 50 mg: Helps one fall asleep faster by quelling anxiety. Passion flower extract also helps regulate blood pressure levels and keep inflammation at bay. Melatonin, 3 mg: A hormone which helps regulate the body’s sleep-wake cycle. Another popular ingredient among sleep aid products. The manufacturer said Peak Life Somnapure won’t only make you fall asleep faster, but also improve your sleep quality and allow you to wake up refreshed. In other words, it claims this product will venture into unchartered territory – a place where competitors didn’t dare explore. Here’s the bottom line, folks: Peak Life Somnapure works. No matter how the ingredients impressed you, some customers (we say around one out of every five) say Peak Life Somnapure didn’t meet their lofty expectations. It just didn’t work for them. We were stumped. After sizing up the product, we sure thought its time-tested ingredients such as valerian root extract and lemon balm extract would see it through. The good news: the naysayers are in the minority. The only reason we can think of is the incompatibility of the ingredients with these customers. Other than that, Peak Life Somnapure has plenty of upside. How about an awesome 500 milligrams of valerian root extract per serving? For emphasis’ sake, the aforementioned ProSupps Crash can only muster 50 milligrams of valerian per serving. How’s that for making a statement? We also think Peak Life Somnapure’s ingredient combination is good. Not only that, some of the components (such as hops extract and chamomile flower extract) have additional health benefits. Any time a supplement has these, it’s time to whoop it up. Your long-term health is always important. We like the simplicity and transparency of the ingredients. Kudos to the folks at Peak Life for revealing all of the ingredient amounts. For that, we give these guys an A for transparency. As for the downsides, the increased amount of valerian root extract is a potential double-edged sword. Bear in mind this ingredient may result in certain side effects (headaches, stomach issues, and ironically, sleeplessness), per the Mayo Clinic. Plus, the combination of valerian root extract and melatonin could cause a very strong sedative effect. Good thing the manufacturer drastically lowered the latter’s amount (three milligrams per serving). We don’t think they’ll produce any unwanted side effects provided you stick to the recommended dosage of two tablets daily. We agree with these claims. We believe Peak Life Somnapure can help you experience all three pillars of sleep. Peak Life Somnapure is intended for healthy individuals who are at least 18 years of age who want to sleep faster, improve sleep quality, wake up feeling refreshed, boost long-term health, and achieve their daily fitness goals. Peak Life Somnapure’s 500 milligrams of valerian root extract per serving may produce headaches, stomach discomfort, and sleeplessness in some individuals. In addition, the combination of valerian root extract and melatonin may produce a strong sedative effect in others. Good ingredient combo. Has many of the time-tested sleep ingredients on the market. Helps quell anxiety. Valerian root extract and lemon balm extract help reduce anxiety for better sleep quality. Extra health benefits. Helps improve heart health, keep free radicals at bay, and regulate blood pressure and blood sugar levels. Great transparency. Manufacturer divulges all of the ingredient amounts. Bravo. Questionable reputation. Some customers say it didn’t work for them at all. Valerian root extract content. Could be a potential double-edged sword for some folks. Valerian and melatonin combo. Some experts believe this produces an over-the-top sedative effect. We honestly thought Peak Life Somnapure is a good product. It has many time-tested ingredients. It also has extra health benefits to boot. However, we also must consider the fact it doesn’t work well for some people. Again, we stress they’re in the minority. To answer an earlier question, no, this product doesn’t hit a home run. We recommend you at least try Peak Life Somnapure. If it works, great. If it doesn’t, there are a ton of other potent sleep products on the market.